-New Jeeps at affordable prices. -Free Pick-up and Drop-off Shuttle service. Route 1 Car Rental offers a range of 4x4 vehicles to accommodate your needs. From our small Suzuki Jimny to our Toyota Land Cruiser, these vehicles will make sure that you can explore all of Iceland! The smallest 4x4 jeep that Route 1 Car Rental offers. It is a 3-door vehicle that seats 4 passengers and accommodates 1 suitcase. For optimal comfort while travelling with this vehicle it is best suited for 2-3 people. The Suzuki Vitara is an automatic, 5-door 4x4 that seats 5 passengers and accommodates 3 suitcases. Easy to drive and very comfortable! Might get a bit tight for 5 people if you have a lot of luggage, but to solve that problem we offer roof boxes. The Grand Vitara is an automatic, 5-door 4x4 that seats 5 passengers and accommodates 4 suitcases. Easy to drive and very comfortable! Might get a bit tight for 5 people if you have a lot of luggage, but to solve that problem we offer roof boxes. In the same price and size category as the Grand Vitara. 5-door automatic 4x4 that seats 5 passengers and accommodates 4 suitcases. Easy to drive and very comfortable! Might get a bit tight for 5 people if you have a lot of luggage, but to solve that problem we offer roof boxes. Biggest 4x4 jeep Route 1 offers! 5-door luxury vehicle with an automatic transmission and runs on a diesel engine. It seats 5 passangers and accommodates 4 suitcases. Highly recommended for a group of 5 adults or for people who enjoy the extra leg space. These are the best known F-roads but there are other F-roads that you’d be able to drive if the condition of the road allows it, some of which are very rough gravel roads but with no unbridged rivers on the way. Upon delivery of the car we will provide you with the map posted below that clearly indicates which roads you cannot drive. We recommend that you plan your trip beforehand so that you are aware of which roads are F-roads and whether they are passable or not at any given time. Please note that all off-road driving is forbidden and punishable by law, and the responsibility is always on the renter when crossing unbridged rivers. 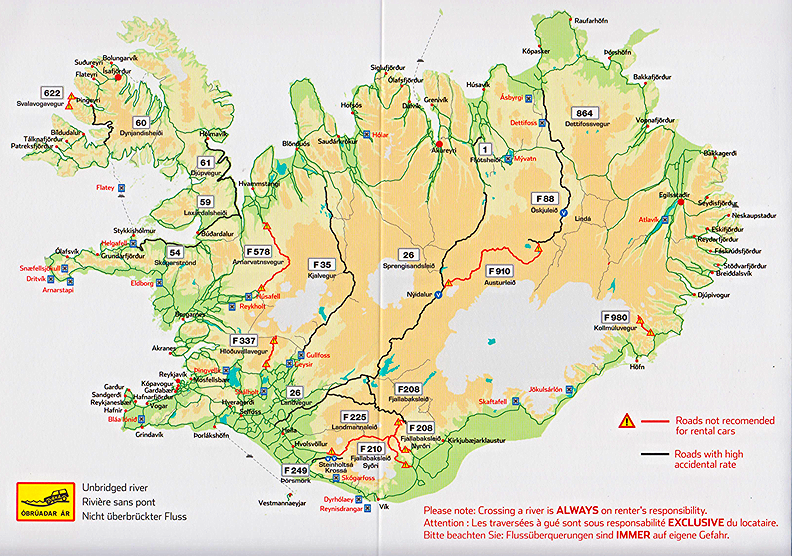 We also recommend that you always make sure that the F-road that you have decided to drive is open, either by calling 1778 (the Icelandic Road Administration), checking the Icelandic Road Administration´s webpage or by talking to the locals as the condition of the roads may vary due to weather and the seasons. It is not uncommon that roads are deemed impassable and closed due to weather. Please know that if you drive on any of these roads all the insurances on the car will be void and you are fully liable for any damage that may occur. 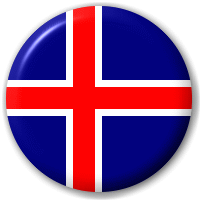 Road restrictions issued by the Icelandic Transport Authority, Icelandic Association for Search and Rescue, Hvolvöllur County Police, Sjóvá - Insurance, Icelandic Road and Coastal Administration, Ministry of The Interior, and The Icelandic Travel Industry Association.